The yachting industry has long held to the belief that a successful luxury yacht charter vessel can expect 12 weeks of charter business a year. 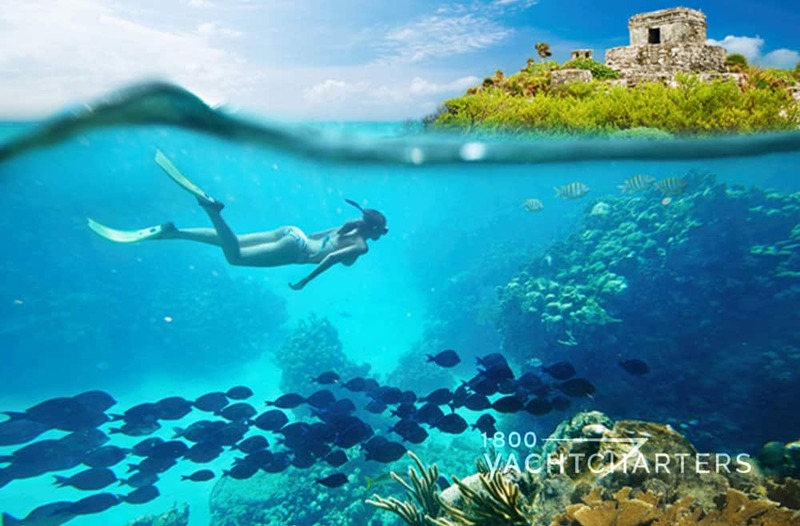 This expectation included both Caribbean yacht charter and Mediterranean yacht charter business. 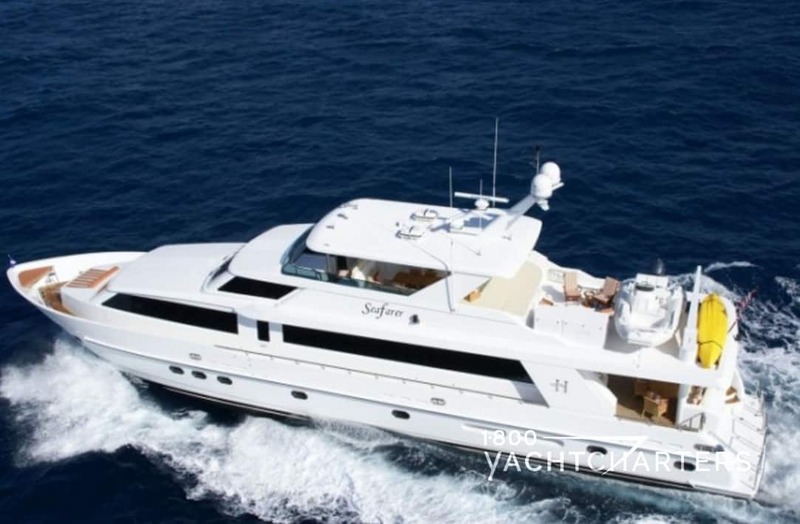 Excluding the small sail boat charters that dominate the Caribbean market, in the world of megayacht and superyacht vessels, there are about 830 yachts 80 feet and larger available for a luxury yacht charter worldwide. What might be surprising to many is this fact: some 600 of these vessels do no more than 3 or 4 weeks of chartering each year. Thus, the upcoming Mediterranean yacht charter summer season has a lot riding on it for boat owners and captains who have — perhaps ill-fatedly from the start — factored 12 weeks of megayacht charter business into their calculations. *Owner’s personal use – 6 weeks. *Yard time (for repair and maintenance) and crossing time to reposition (Caribbean to the Mediterranean, etc.) – 26 weeks. *Actual Possible Charter Time: 14 weeks. Bareboat or crewed yacht charter? Yacht charter vacations fall into two categories – bareboat charter and crewed charter. A bareboat charter is where you rent a sailboat or powerboat that has no crew. It is similar to renting a car that you drive yourself. Bareboat charters are for experienced sailors or yachtsmen and can be “self-drive” (where you do all the work and driving), or you can hire a skipper to drive the boat for you for either part of the trip or for the entire trip. WHAT IS A YACHT CHARTER WITH CREW? Crewed charters are where you rent a sailboat or powerboat that has a crew that consists of a captain/skipper to drive the boat and any number of other members. Additional crew members can be such positions as hostess/stewardess (waits on the charter guests), chef (prepares all meals), first mate (helps with the operation of the vessel), and engineer (handles the engines), for example. HOW MANY CREW MEMBERS ARE ON A YACHT WITH CREW? The largest yachts (megayachts and superyachts) can have as many as 18 crew members, and some even have more crew members than guests onboard at any time! Charter guests select bareboat yacht charters for a number of reasons; bareboats are more affordable than crewed yachts, an independent customer can pilot the yacht him/herself, or the customer owns the same kind of boat and wants to enjoy it in a different location than he/she does at home, for example. Florida yacht charters are often bareboat charters, as guests like to experience sail boat charters and pilot the boat around the islands of the Florida Keys. 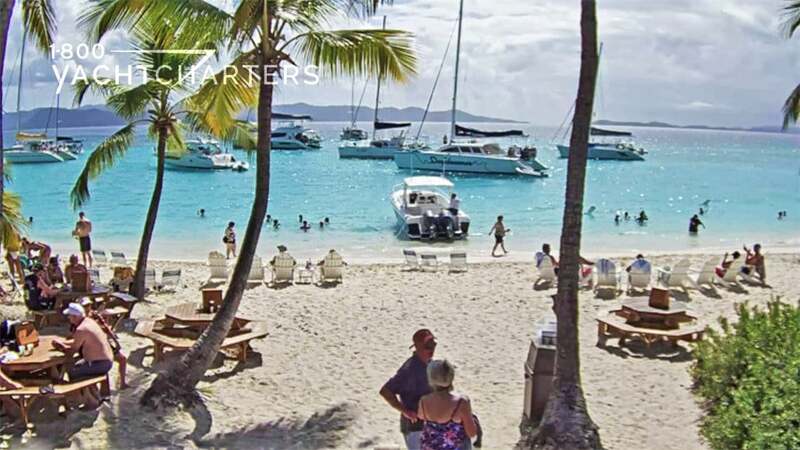 Bareboaters will often participate in Virgin Islands Yacht Charter flotillas, where multiple Beneteau sailboats or Robertson and Caine catamarans will sail together throughout the islands, stopping in port to enjoy the Caribbean flair of such popular Virgin Island landmarks as Pusser’s or Foxy’s, or visiting the must-visit, no dock, swim-up Soggy Dollar Bar in the British Virgin Islands (aptly named Soggy Dollar because once you swim up to it, your dollars are soggy)! 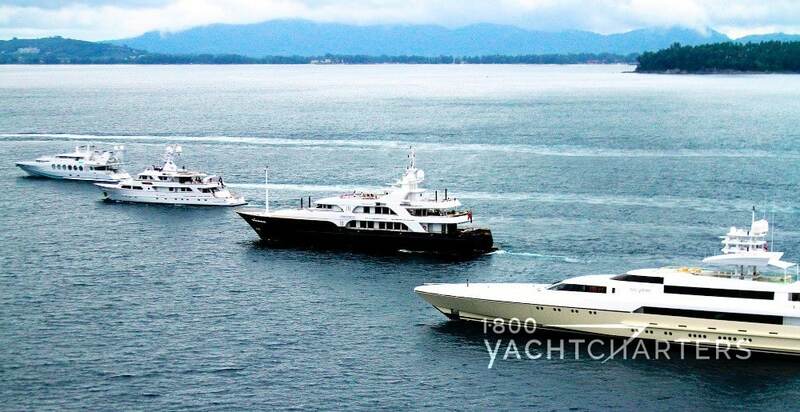 WHY CHOOSE A YACHT WITH CREW? On the other hand, charter guests select crewed yacht charter vacations because they are celebrating a special occasion or enjoying a corporate event, they want to enjoy a vacation where they don’t have to do any work, or they have a large group of people and want to spend a special vacation with them without having to do any of the vacation planning once underway. WHAT ARE TRADITIONAL CREWED YACHT VACATIONS? 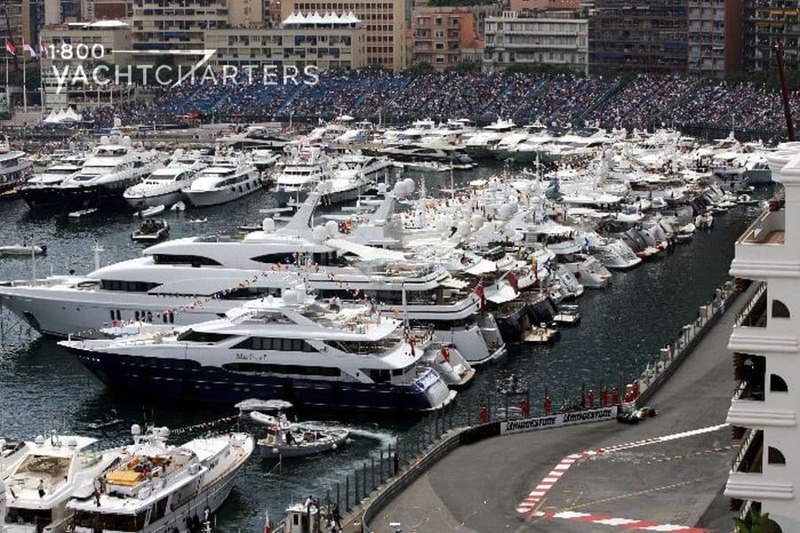 Corporate events include such things as Monaco Grand Prix yacht charters, where a company will rent a megayacht to be used as a meeting place (and floating hotel), what to pack on a sailboat vacation, as well as its being a perfect venue for entertaining clients and for watching the Monaco Grand Prix race. Crewed yachts are often selected for unique first-time vacation destinations, for instance, a Croatia yacht charter or Greece yacht charters, as captains and crewmembers know the waters, the locals, and the area. You’ve decided to charter a motor yacht in Greece for a week. What an exciting idea! You can’t decide whether you want to go on a Trinity Yacht Charter or a Feadship Yacht Charter, and you’re also thinking that sail boat charters are also a romantic way to vacation. Thoughts go through your mind. Do I need exercise to go yachting? How do I prepare for the vacation? 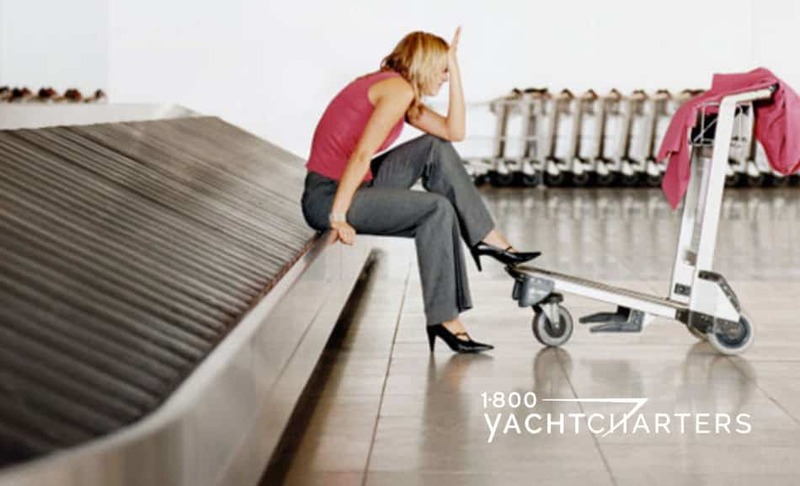 Is a yacht charter physically difficult? 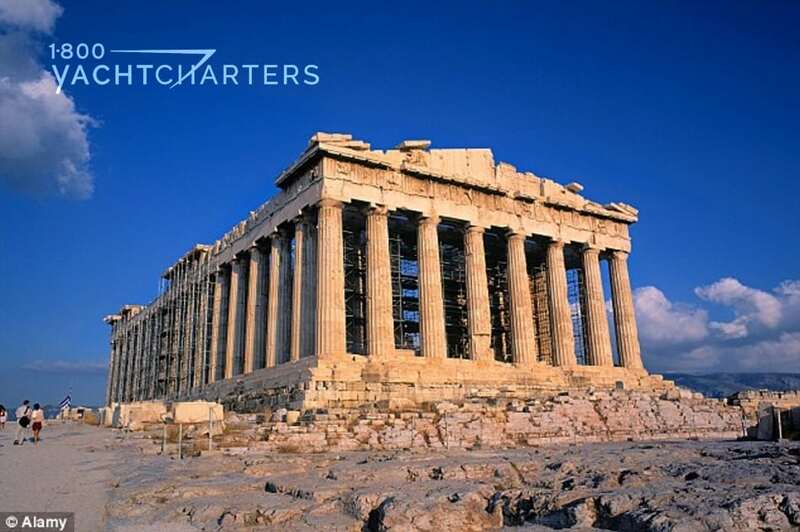 Regardless, all Greece yacht charters are fun, educational, and adventurous – no matter what kind of private yacht you enjoy. If you haven’t exercised in a long time, you’ll want to prepare your body with some basic exercises before heading to the Aegean. Since you’ll be hiking up rocky hills and exploring historic landmarks like the Parthenon and the Acropolis, do a series of ankle stretches, ankle rolls, and knee bends to prepare. Since all megayachts have stairs that you’ll descend and ascend each day on your boat, practice climbing stairs with a stairmaster, walking manual stairwells in your area, or just simply walking an inclined area where you live. Visiting landmarks is wonderful, but it does entail a lot of walking. To maximize your cardio (heart) and overall fitness, just walk. Park your car far from a store when you grocery shop. Walk around the block and enjoy nature. Take your dog for a long overdue walk. Hop on the treadmill and go for a stroll. No worries. The best thing is that you really don’t NEED exercise for your Mediterranean yacht charter event – it is just good for your heart, your mind, and your overall attitude! Your crew will do the majority of the exercising during your yacht charter, but you will also be exercising for fun in your daily activities onboard! The food on your yacht charter will be amazing, too, and it will be based on your desires! Mega yacht charter vacations, whether on a sail boat charter or a superyacht, are a great way to travel – they are good for the mind as well as the body! This entry was posted in Yacht Charter Destinations Educational and tagged yacht charter Greece, greece yacht charter, exercise on yacht charter, exercise, walking, treadmill, incline, Parthenon, Acropolis, do i have to exercise to go on a yacht charter?, is a yacht charter physically demanding? You are planning a Monaco Grand Prix yacht charter on one of the largest yachts in the world. You speak English, but you’d like to be polite to the people of the area. Monaco’s official language is French, so a few basic French phrases will be most helpful. The people of Monaco also speak English and Italian, but they also speak Monegasque and Occitan (the southern French dialect) within their areas, although they are becoming more rare as the population changes. English = Do you speak…? English = How are you ? ANYTIME. We are at your service. Your summer plans involve a week-long luxury yacht charter in the Bahamas. You have fair skin that burns easily, and you want to make sure to bring the right skincare product to protect you from the sun on your yacht charter vacation. Important terms to consider are SPF, UVA, UVB, waterproof, and water resistant. SPF stands for Sun Protection Factor. The higher the number, the more protection you are offered from the sun’s harmful UVB rays. The SPF number shown on the bottle is equal to the amount of time you can stay in the sun without burning. If a sunscreen is SPF 30, you can stay in the sun 30 times longer without burning than you could if you weren’t wearing any. This is particularly helpful for Bahamas yacht charters, where you are enjoying the beach and the water sports toys, and you don’t realize that you are burning. SPF sunscreen ratings go above 50. The difference between an SPF 30 and an SPF 50 is only 1 to 2%, so save your money and don’t purchase the highest SPF you can find. Just be diligent about making sure that you’re always wearing your SPF 30 on your Bahama yacht charters. Do the UVA and UVB ratings on the sunscreen matter? YES! UVA rays are primarily responsible for the aging effects of the sun on your skin (UVA rays break down the collagen in your skin, which causes wrinkles), and UVA rays can cause skin cancer. UVB rays, on the other hand, are responsible for sunburns and skin cancer. 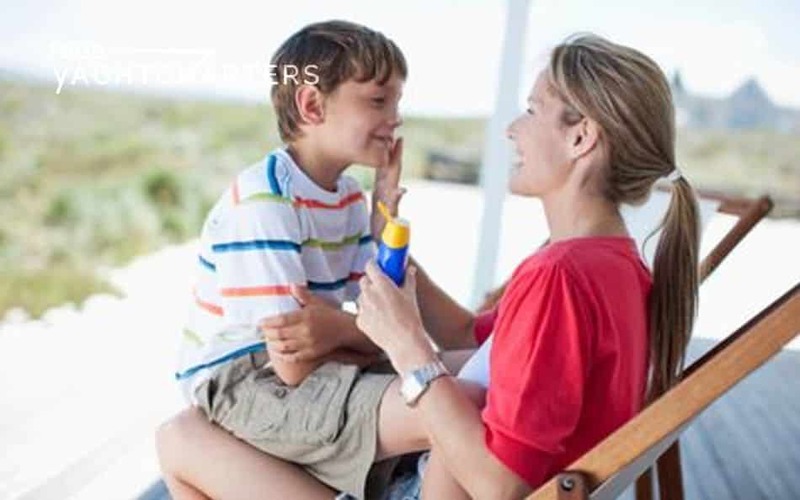 Always choose a sunscreen product that has both UVA/UVB protection or is a “broad spectrum” protectant. Since you’ll be jet skiing, water skiing, snorkeling, and likely spending a lot of time in the water on your Caribbean yacht charter, make sure to select a sunscreen that is either waterproof or water resistant. Waterproof sunscreens provide longer protection in the water than do their water resistant counterparts. Bottom line – choose at least an SPF 30 sunscreen that is waterproof or water resistant and provides protection from both UVA and UVB rays, and you’ll be all set for your superyacht vacation! What luxury sailing charter is complete without a little silliness and merriment with friends? Although full moon parties take place in different corners of the world, any Virgin Island yacht charter enthusiast will tell you the parties that take place in the British Virgin Islands (aka, the BVI) are some of the most renowned – celebrating both lunar madness and traditional island culture. The rowdiest of these takes place at Bomba’s Shack in Capoons Bay. 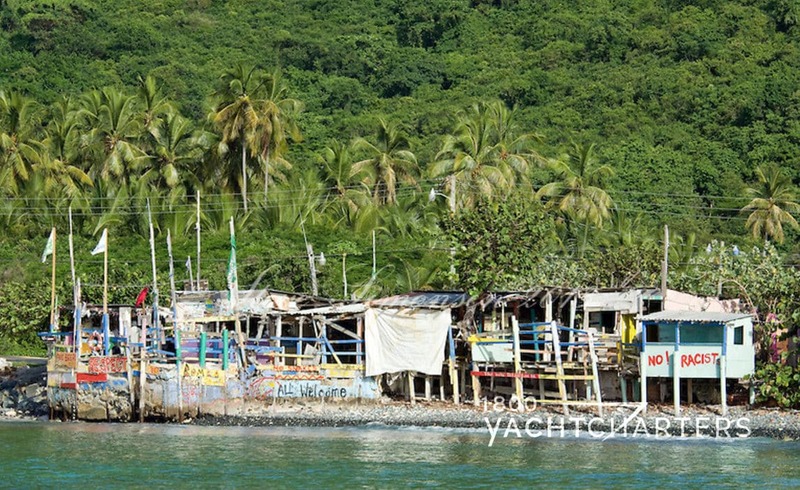 It may not look like much, but Bomba’s Shack is a happening bar set alongside the beach on Apple Bay, at the West End of Tortola, BVI. Each month, the legendary Full Moon Party draws loads of locals and visitors, especially luxury sailing charter passengers looking to experience real island life. Held monthly on the night of the full moon, moonlight madness spills into the street, the beach, and everything in between.